Jeanette MacDonald, the movie musical's first superstar, was an American original whose onscreen radiance mirrored a beguiling real-life personality. 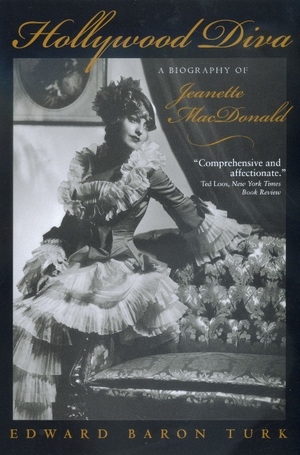 Based in large part on the author's exclusive access to MacDonald's private papers, including her unpublished memoir, this vivid, often touching biography transports us to a time when lavish musical films were major cultural events and a worldwide public eagerly awaited each new chance to fall under the singer's spell. Edward Baron Turk shows how MacDonald brilliantly earned her Hollywood nickname of "Iron Butterfly," and why she deserves a privileged position in the history of music and motion pictures. What made MacDonald a woman for our times, readers will discover, was her uncommon courage: Onscreen, the actress portrayed strong charcters in pursuit of deep emotional fulfillment, often in defiance of social orthodoxy, while offscreen she personified energy, discipline, and practical intellect. Drawing on interviews with individuals who knew her and on MacDonald's own words, Turk brings to life the intricate relations between the star and her legendary costars Maurice Chevalier, Clark Gable, and, above all, baritone Nelson Eddy. He reveals the deep crushes she inspired in movie giants Ernst Lubitsch and Louis B. Mayer and the extraordinary love story she shared with her husband of twenty-seven years, actor Gene Raymond. More than simply another star biography, however, this is a chronicle of American music from 1920s Broadway to 1960s television, in which Turk details MacDonald's fearless efforts to break down distinctions between High Art and mass-consumed entertainment. Hollywood Diva will attract fans of opera and concert music as much as enthusiasts of the great Hollywood musicals. It is first-rate cultural and film history. Edward Baron Turk is Professor of French and Film Studies at the Massachusetts Institute of Technology and author of the prize-winning Child of Paradise: Marcel Carné and the Golden Age of French Cinema (1989).